I have had plenty of time to contemplate this postcard to you. Most of the day in fact, as I’ve wasted that long trying to get to the bottom of what ought to be a rather simple cross-border railway problem. Later this week – on Thursday 8th October – I am due to travel from Berlin to Brussels. Then, booked on the same ticket, I travel onwards to London on Friday 9th October. 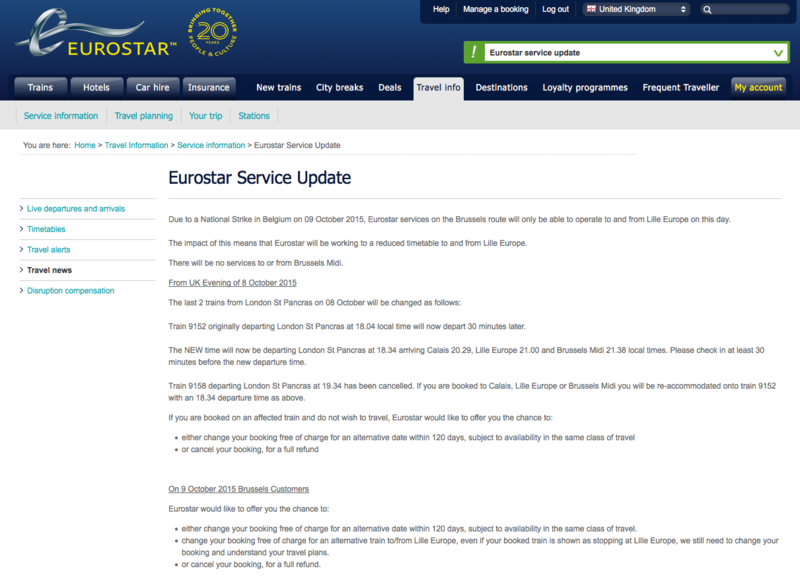 Unfortuntately on 9th October there is a complete rail strike in Belgium – as explained in depth by both Eurostar (whose train I’m taking to London – screenshot of their info here), and Belgian railways SNCB (screenshot here). The thing is my ticket is booked with Deutsche Bahn. And their website about disruptions mentions ICEs and Thalys, but not Eurostar (screenshot of the relevant section here). And that despite the fact that DB not only sells, but also heavily advertises its London Spezial tickets. To work out how to rebook my ticket, I started by contacting DB on Twitter, and was told they had no information, and that I needed to call DB’s service centre. The call centre told me they had no information, and hence I needed to go to a station. 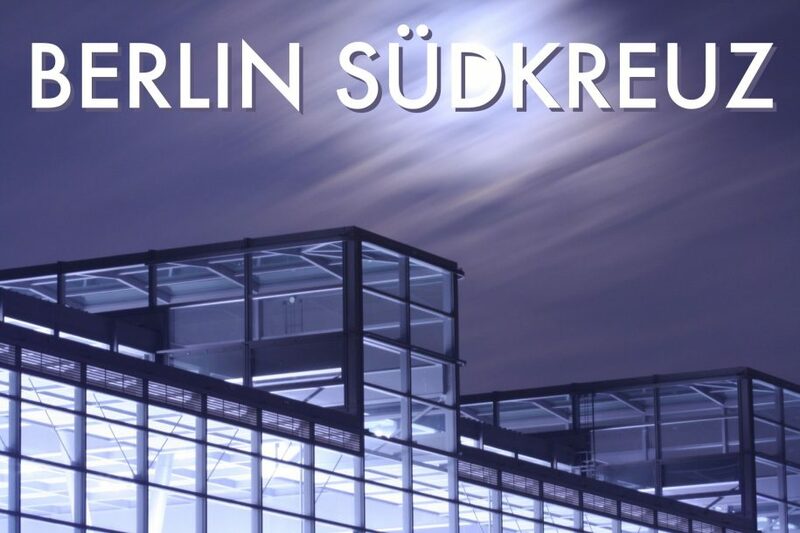 So I headed off to Berlin Südkreuz (lucky I live quite near it). There DB’s employee told me, after lots of tapping away at a keyboard, and heavy sighs, that there was nothing that she could do. DB, she said, had no information about my Eurostar train being cancelled in its systems. I pointed at the printout of SNCB’s website I had brought along with me, but it was to no avail – so long as the train is not cancelled in DB’s system, she said, there is nothing that can be done. Anyway, she went on, what are we supposed to do here, in DB, when the strike is in Belgium? Well sorry DB, you sell tickets for through trains, so you have to have a system in place for what happens when things go wrong! What am I supposed to do as a customer? 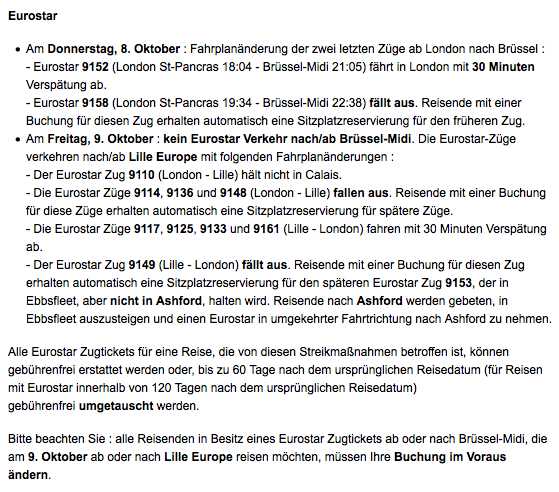 Buy a new ticket, at last-minute prices, because DB refuses to put Eurostar’s cancellations into its systems? Look at this way, Violeta. Problems occur. Strikes happen. We, EU-wide rail passengers, understand that. But when I, the passenger, have more information about a strike in Belgium than the whole of German railways does, do you not think that is rather bizarre? If EU-wide rail booking is to be possible, then the EU needs to make sure an EU-wide problem notification system accompanies that. Otherwise passengers are going to loose out, just as I did today. And you know what, Violeta, the biggest irony of all is that on my return journey through Brussels I am even working for your Commission DG, chairing a panel on smart mobility at the Open Urban Day on 14th October. Bit odd to be talking of smart mobility when it takes a passenger’s tweet to try to get DB and Eurostar to communicate with each other. Now in the end this whole thing may be solved, because – even though they don’t have to – the kind folks at Eurostar’s customer service are looking into the issue for me, and I am confident it will work out in the end. But don’t you think this whole thing shows your model for competition among the EU’s railways leaves a lot to be desired?